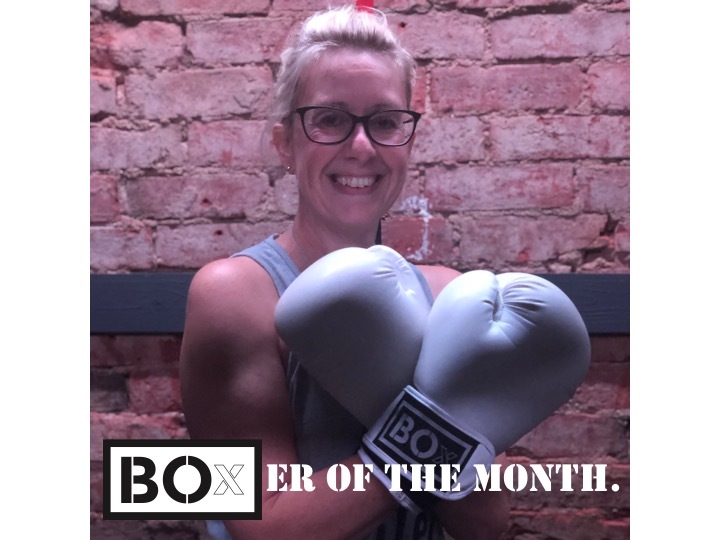 Our BOxER of the month in August was Anita Highet. Anita quietly comes into the studio with her beaming smile, her bubbly personality and her friendly temperament and then….. she changes into her Alter Ego (we’ve named her Nita-Neats; neat on the bag and aggressive behind closed doors). Anita has kept to her schedule every week (give or take a few holidays). She doesn’t moan, give up or expect something for nothing. She works hard in class and gives her body the refuel it needs after class with a protein shake and for that, she’s seeing the rewards. Fitness is a lifestyle choice and Anita has proven you can be successful in the office and successful in the studio. It’s been over a year since I started coming to BOx and I still love it. I decided that having hit the big 4 0 it was time to step up my game and get fit. I hadn’t really done any serious exercise since school and when I did join a gym or go to a class I just gave up after a couple of weeks. In truth I found exercise boring full stop. I came to my first class at BOx with a friend who asked me to go along with her at the last minute. It was Annie’s Saturday morning BOxBEAT class and I really enjoyed the whole concept; the tunes, the moves and the lighting! There’s nothing like it. I’ve not looked back, the mix of classes keeps me interested, it’s not the same old every week and I’m happy with the results I’ve seen on my body and I’m fitter than ever. My main aim was to tone up and whilst there is still a way to go to get my six pack, I’m still loving the journey. Thanks Bo and Annie for creating a cool, fab, friendly place for us to work out and have fun doing it.